Home / 2D animation / CP / news / UK & Ireland / Web & Independent Animation / web animation / Watch the British Comedy Award Winning Short 'Carpark'. 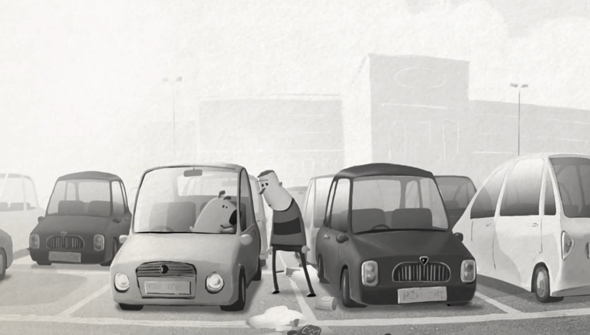 Watch the British Comedy Award Winning Short 'Carpark'. The British Comedy Awards have been running for 25 years now, celebrating the best in UK-based comedy talent. This year's ceremony introduced a new category- Best Internet Comedy Short, recognising online video for the very first time. Two of the nominees this year were animated- Aardman Animation's crowdfunded Brand New Morph, and the eventual winner Carpark. Sadly, the award didn't make the main Channel 4 broadcast of the ceremony, instead being shunted onto the aftershow on Digital sister channel E4. But it's a start. Coming from London studio Birdbox, Carpark is an extremely funny 2D animation. With a largely monochrome colour pallet and a tone reminiscent of Simon's Cat, it's a worthy winner. Check it out below.